I recently noticed that many other bloggers are incorporating their favorite beauty products into their blogs to share. I wanted to do the same! 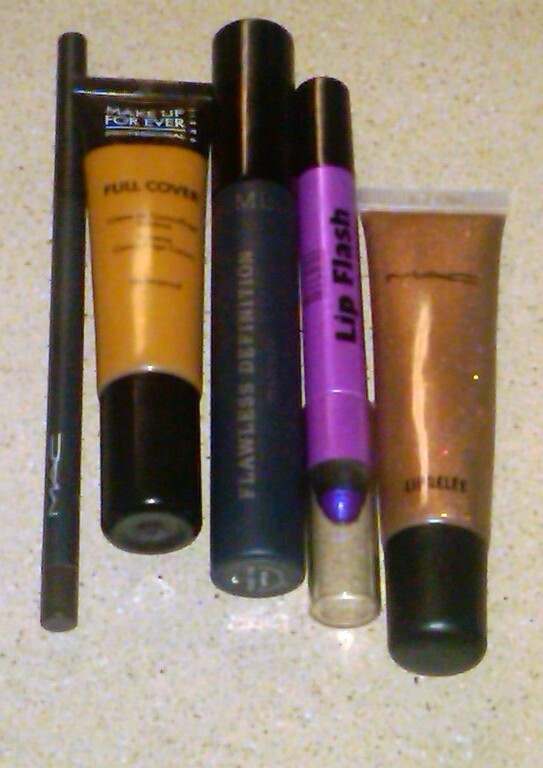 These are just a few products that I love! 1. MAC Eyebrow Pencil -- Eyebrow pencils had always been in my "drugstore shopping list." It wasn't until I read another blogger talking about this pencil and I decided to give it a try. O-M-G! Not only does it go on smooth, but it literally lasts all day! Love, love, love! 2. Make Up For Ever Full Cover Concealer -- Lately, I have begun branching out and trying new products. In talking to a beauty advisor at Sephora, this product was recommended. Let me just say... I can say hands down that this is the BEST concealer I have EVER used! I say this because I can put this concealer on and not only does it cover up undereye circles, but I can wear it alone without anything else and appear to have flawless skin. A must have! 3. Bare Minerals Flawless Definition Mascara -- This little treat came in a Sephora gift I recently received. I'm one of those people that are very picky with mascara because I desire volume and length. This little baby gives me both. I have never really been a Bare Minerals fan before, but I could see myself purchasing this because it makes my lashes beautiful. 4. Milani Lip Flash -- I believe everyone knows that I'm a big fan of long lasting lip color. With all I have to do in a day, I need it! This little baby reminds me a lot of the Sephora lip pencils that I mentioned in a previous blog, which you can find HERE. They do not last as long but for half the price, I'll say it's a major keeper! 5. MAC "Straight to the Head" Lipgelee -- Hands down, THIS is my favorite lip gloss of all time. MAC packaged awesomeness in a container with this. If you're a fan of shimmer and nudes, this is your baby right here. It's sort of a copper, champagne-ish type of color that I can literally wear with anything. If you're a fan of lip gloss, this is a must have for your collection. Any comments or questions? Want to share your fave items? Leave comments!